Wizkids has begun to show off figures from the upcoming DC HeroClix: Gen13 2014 Monthly Organized Play kit! The kit will have 3 limited edition figures not found anywhere else, and all three figures can be used with the Gen13 or Villains for Hire team bases from DC HeroClix: The Teen Titans. The first figure to be shown off is Gen13’s mentor and the leader of Team 7, John Lynch! The figure clocks in at 93 points with a range of six squares. Like any good leader, the figure works behind the scenes as support. His improved movement, called Working in the Shadows, allows him to ignore hindering terrain when he moves. The trait, Double Agent, gives him and friendly characters with the Gen13 or Team 7 keywords access to either the Police or Underworld team abilities. Choose one of the team abilities at the beginning of the game. 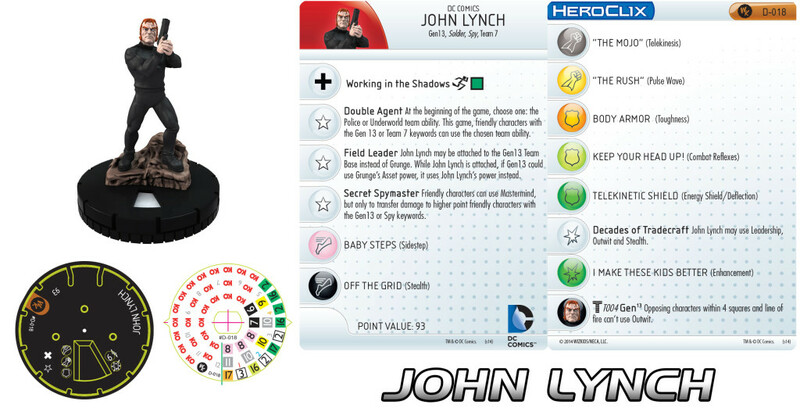 John Lynch’s second trait, Field Leader, allows him to be played on the #T-004 Gen13 team base from the DC HeroClix: The Teen Titans set. Field Leader lets John Lynch replace #034 Grunge on the Gen13 team base. Additionally, while John Lynch is attached to the team base, instead of Grunge’s Asset power it uses the following one that prevents opposing characters within 4 squares from using Outwit. The figure’s third trait is called Secret Spymaster, and lets friendly characters use Mastermind, but only to transfer damage to higher point friendly characters with the Gen13 or Spy keywords. Lynch’s first click has Telekinesis to place the rest of his team into position while Sidestep lets him stay out of the way until he’s needed. In the damage slot is a special power called Decades of Tradecraft, which lets him use Leadership, Outwit and Stealth. In the defense slot, Toughness represents Lynch’s body armor. Lynch’s second click has Combat Reflexes in place of Toughness. On the third click he switches out Telekinesis for Pulse Wave. Defensively, he picks up Energy Shield/Deflection. Energy Shield/Deflection sticks around for Lynch’s last two clicks but Sidestep moves over for Stealth and Decades of Tradecraft disappears in favor of Enhancement. Telekinesis returns for a click before John Lynch closes out his dial with Pulse Wave.